Wal-Mart, stung by an embarrassingly long sales slump, is finally ready to do something about it. On Monday, Wal-Mart announced it is bringing back thousands of products that were unceremoniously dumped from stores, saying it is ready to roll up its sleeves to win the lowest-price battle with its rivals. To show its resolve, the world's largest retailer is adding a new tagline to its slogan "Save Money. Live Better." That tagline, which will now appear throughout Wal-Mart stores is "Low prices. Every day. On everything." "What our customers are telling us is that they want the right products in a one-stop shop at the lowest prices. We're trying to reestablish that message," said Duncan Mac Naughton, Wal-Mart's chief merchandising officer. Among the products returning to Wal-Mart shelves: Hellman's mayonnaise and Febreze and Glade trigger handle products. Nationwide, Wal-Mart is also making localized additions to its stores. For example, the retailer is increasing fish supplies in Central Florida stores, adding more ice fishing and ice hockey products in Minneapolis, and boosting inventory of hiking and pool supplies in its Phoenix stores. Wal-Mart's in a tough spot. Sales at Wal-Mart (WMT, Fortune 500) stores open at least a year -- a key performance measure known as same-store sales -- have fallen for seven straight quarters. Adding insult to injury, not only is the discounter losing more shoppers to its competitors, its chief rival Target (TGT, Fortune 500) has been beating Wal-Mart's prices on some groceries and household products. After a disappointing holiday season, Wal-Mart executives were quick to admit to a faulty strategy and reiterated an urgent need to fix merchandising mistakes made while navigating through the recession. Wal-Mart's damage control starts with clearer communication about what shoppers can expect. Mac Naughton said the "Low prices. Every Day. On Everything" message better communicates Wal-Mart's founding principle of providing low prices day in and day out. Low prices: Wal-Mart said store managers will check competitors' prices more frequently. The company will press suppliers to lower their costs and will simplify its "ad match" policy. From now on, if customers find a lower advertised price, Wal-Mart promises to match that price at the register in all stores without requiring shoppers to bring in a competitor's ad as proof. Giving more choices: After alienating customers by culling too many products from shelves, Wal-Mart is bringing the variety back by adding 8,500 items to stores. Flags will appear next to the revived brands later this month that say, "It's back." "We're bringing back products and brands [our customers] want," said Mac Naughton. The retailer has already boosted variety in pasta, snacks and beverages and plans to roll out more products in household goods such as paper towels, toilet paper and laundry detergent. Later this year, Wal-Mart plans to expand the mix in electronics, clothing, sporting goods and outdoor product categories. Mac Naughton said the company is exploring other categories including auto and office supplies and home appliances. "These changes are good for Wal-Mart," said Marshal Cohen, chief retail analyst with NPD Group. Wal-Mart is feeling the pressure because the discount playing field is much broader today, said Cohen. Dollar stores weren't considered a threat by Wal-Mart, but recently they've successfully taken on their giant competitor, particularly during the recession. "But it's not enough to just change the tagline and add more products" said Cohen. 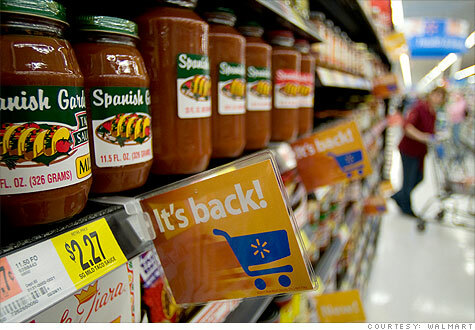 "Wal-Mart has to consistently improve and do something new if it wants to regain customers." After alienating shoppers by removing too much variety from its stores, Wal-Mart is bringing back about 8,500 items to its merchandise mix.Wal-Mart Restores Product Assortment .Walmart to broaden product assortment by approximately 8,500 items or 11 percent in an average store.Low prices day-in and day-out on the broadest assortment of merchandise.of products on our shelves and we'll continue to bring back great products at great prices.The world's largest retailer, best known for its football field-size in operating the smaller stores is determining the merchandise mix. The Chatham Express store, for example, is 10,000 square feet and carries 8,500 items.